Caribbean ﻿Jumbo ﻿Hammocks ﻿﻿ ﻿bring style ﻿and relaxation to any location. Our Caribbean Jumbo Hammocks are hand-woven from soft spun polyester. Unlike similar cotton hammocks, they will not rot, mold or mildew. The hammock bed is woven with an extra tight micro-weave design providing the ultimate in comfort and stability. The wood spreader bar has multiple coats of marine varnish to protect it from the elements and is a full 55 inches wide providing ample room for one or two people. This hammock hangs easily from two suspension points at least 12.5 feet apart. These are the largest and most comfortable hammocks anywhere. The hammock suspension hardware, hammock stands, and hammocks are sold here as a set. Purchase the discounted hammock with stand set and save. Siberian Larch Wood Hammock Stands are crafted from multiple laminated layers of natural Siberian Larch wood for superior strength and support. Each of the four layers of Siberian Larch are hand bent and radio frequency glued to form thicker, heavier beams that are characteristically arc shaped. Meticulous sanding is followed by hand oiling of the wood for protection against the elements. All the hammock stand hardware is Stainless Steel and arranged in a double screw design for extra strength and stability. This hammock stand is 13 feet long and designed to work in conjunction with our Jumbo Caribbean Hammocks. The hardware used to hang the hammock is galvanized steel. Assembly is required. The wood stand will be a lighter color than the one pictured. The color of the wood is affected by additional coats of stain, marine varnish, and exposure to the elements. To achieve the desired color, test varnishes and stains on the underside of the hammock. Once you are satisfied with the results, continue to finish the hammock stand. Your new hammock stand will have a lighter color. The color darkens with coats of varnish, stain, and age. 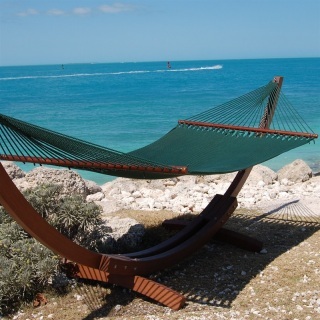 Caribbean Jumbo Hammocks made of polyester and wood spreader is varnished and 55 inches wide. This hammock color is Mocha. The wood hammock stand will be a lighter color than the one pictured. The color of the wood is affected by additional coats of stain, marine varnish, and exposure to the elements. To achieve the desired color, test varnishes and stains on the underside of the hammock. Once you are satisfied with the results, continue to finish the hammock stand. The stand comes with hardware to hang a hammock. Caribbean Jumbo Hammocks made of polyester and wood spreader is varnished and 55 inches wide. This hammock color is Purple. The wood hammock stand will be a lighter color than the one pictured. The color of the wood is affected by additional coats of stain, marine varnish, and exposure to the elements. To achieve the desired color, test varnishes and stains on the underside of the hammock. Once you are satisfied with the results, continue to finish the hammock stand. The stand comes with hardware to hang a hammock. Caribbean Jumbo Hammocks made of polyester and wood spreader is varnished and 55 inches wide. This hammock color is Green. The wood hammock stand will be a lighter color than the one pictured. The color of the wood is affected by additional coats of stain, marine varnish, and exposure to the elements. To achieve the desired color, test varnishes and stains on the underside of the hammock. Once you are satisfied with the results, continue to finish the hammock stand. The stand comes with hardware to hang a hammock. Caribbean Jumbo Hammocks made of polyester and wood spreader is varnished and 55 inches wide. This hammock color is Rainbow. The wood hammock stand will be a lighter color than the one pictured. The color of the wood is affected by additional coats of stain, marine varnish, and exposure to the elements. To achieve the desired color, test varnishes and stains on the underside of the hammock. Once you are satisfied with the results, continue to finish the hammock stand. The stand comes with hardware to hang a hammock. 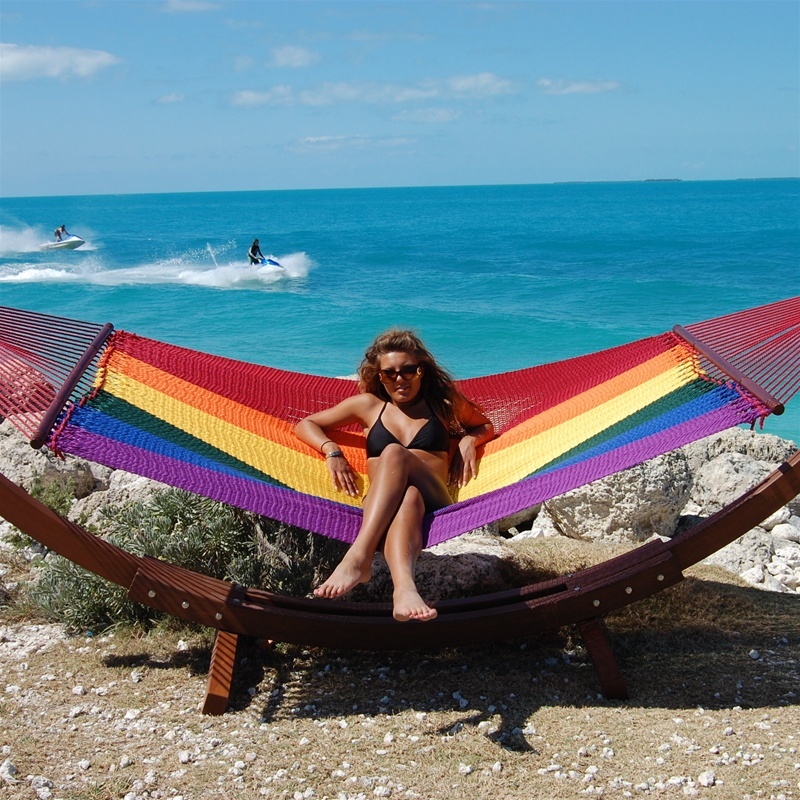 Caribbean Jumbo Hammocks made of polyester and wood spreader is varnished and 55 inches wide. This hammock color is Multicolor. The wood hammock stand will be a lighter color than the one pictured. The color of the wood is affected by additional coats of stain, marine varnish, and exposure to the elements. To achieve the desired color, test varnishes and stains on the underside of the hammock. Once you are satisfied with the results, continue to finish the hammock stand. The stand comes with hardware to hang a hammock. 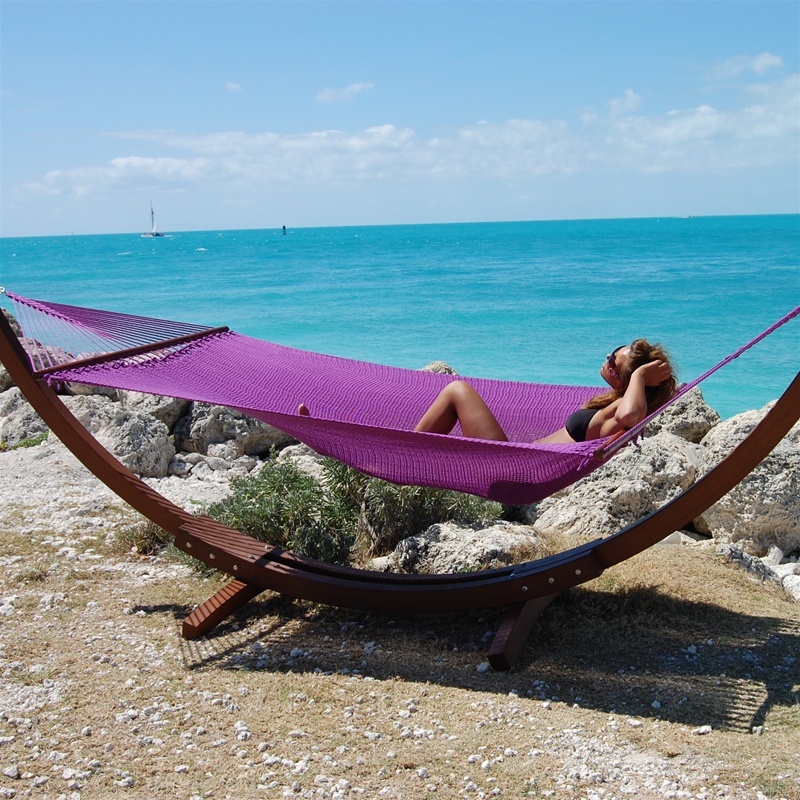 Caribbean Jumbo Hammocks made of polyester and wood spreader is varnished and 55 inches wide. This hammock color is Light Blue. The wood hammock stand will be a lighter color than the one pictured. The color of the wood is affected by additional coats of stain, marine varnish, and exposure to the elements. To achieve the desired color, test varnishes and stains on the underside of the hammock. Once you are satisfied with the results, continue to finish the hammock stand. The stand comes with hardware to hang a hammock. Caribbean Jumbo Hammocks made of polyester and wood spreader is varnished and 55 inches wide. This hammock color is Red. The wood hammock stand will be a lighter color than the one pictured. The color of the wood is affected by additional coats of stain, marine varnish, and exposure to the elements. To achieve the desired color, test varnishes and stains on the underside of the hammock. Once you are satisfied with the results, continue to finish the hammock stand. The stand comes with hardware to hang a hammock. Caribbean Jumbo Hammocks made of polyester and wood spreader is varnished and 55 inches wide. This hammock color is Yellow. The wood hammock stand will be a lighter color than the one pictured. The color of the wood is affected by additional coats of stain, marine varnish, and exposure to the elements. To achieve the desired color, test varnishes and stains on the underside of the hammock. Once you are satisfied with the results, continue to finish the hammock stand. The stand comes with hardware to hang a hammock. Caribbean Jumbo Hammocks made of polyester and wood spreader is varnished and 55 inches wide. This hammock color is Caribbean Blue. The wood hammock stand will be a lighter color than the one pictured. The color of the wood is affected by additional coats of stain, marine varnish, and exposure to the elements. To achieve the desired color, test varnishes and stains on the underside of the hammock. Once you are satisfied with the results, continue to finish the hammock stand. The stand comes with hardware to hang a hammock. Caribbean Jumbo Hammocks made of polyester and wood spreader is varnished and 55 inches wide. This hammock color is Tan. The wood hammock stand will be a lighter color than the one pictured. The color of the wood is affected by additional coats of stain, marine varnish, and exposure to the elements. To achieve the desired color, test varnishes and stains on the underside of the hammock. Once you are satisfied with the results, continue to finish the hammock stand. The stand comes with hardware to hang a hammock. Caribbean Jumbo Hammocks made of polyester and wood spreader is varnished and 55 inches wide. This hammock color is Orange. The wood hammock stand will be a lighter color than the one pictured. The color of the wood is affected by additional coats of stain, marine varnish, and exposure to the elements. To achieve the desired color, test varnishes and stains on the underside of the hammock. Once you are satisfied with the results, continue to finish the hammock stand. The stand comes with hardware to hang a hammock.